It's Facebook Fridays! for October 12, 2018, and we want to make your next trip to the card room a good one! The Lucky Mojo Curio Company is holding a random drawing to give away 4 luck-drawing spiritual supply prizes to help you walk away from the tables as a winner. 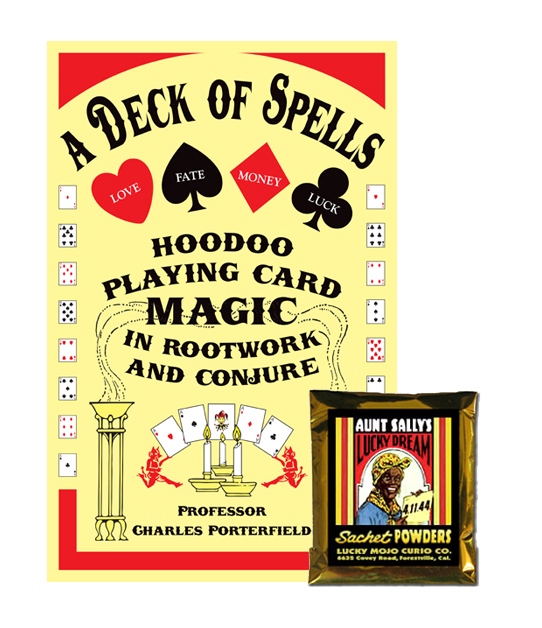 This week each fortunate contestant will receive more than 100 spells, charms, and authentic old-time divination methods employing simple playing cards, as expounded in Professor Charles Porterfield's book, "A Deck of Spells: Hoodoo Playing Card Magic in Rootwork and Conjure" -- plus a packet of hand-made Lucky Mojo brand Aunt Sally's Lucky Dream Sachet Powders, a traditional product used for dusting the cards and for catching a winning streak through dreams and premonitions. First thing tomorrow morning, we will select FOUR winners at random, announce their names here, and ask them to message the Lucky Mojo Facebook Page with their mailing addresses, so we can send them their FREE book and spiritual sachet powder. We have a winner! In fact, we have 4 lucky winners! Our Facebook Fridays! winners for October 12, 2018 are: Ebonie F. Thomas, William Jones, Conchita Cartago, and Fia Rose.